Washington (March 13, 2014)—The Pew Research Center today released a new report examining the spectrum of Americans’ relationships with public libraries. 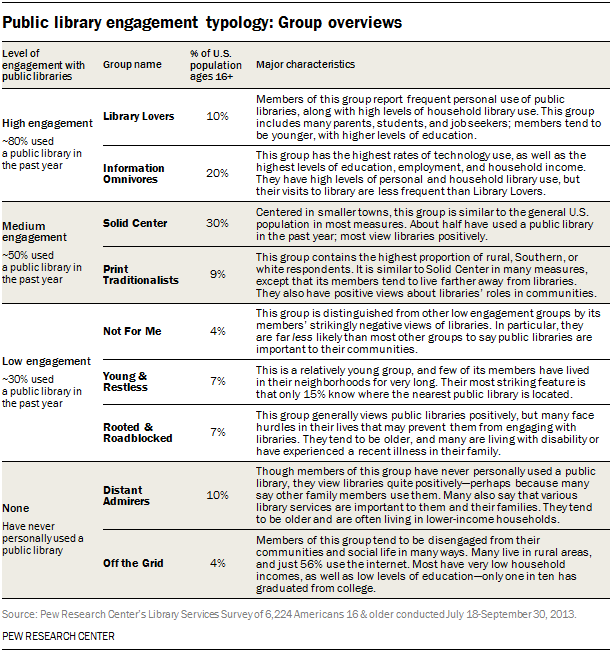 This elaborate typology of groups based on their library engagement—the first of its kind—sheds light on broader issues around the relationship between technology, libraries, and information resources in the U.S.
Public library users and proponents are not a niche group: 30% of Americans are highly engaged with public libraries, and an additional 39% fall into medium engagement categories. Americans’ library habits do not exist in a vacuum: People’s connection—or lack of connection—with public libraries is part of their broader information and social landscape. As a rule, people who have extensive economic, social, technological, and cultural resources are also more likely to use and value libraries as part of those networks. Many of those who are less engaged with public libraries tend to have lower levels of technology use, fewer ties to their neighbors, lower feelings of personal efficacy, and less engagement with other cultural activities. Technology users are generally library users: A common narrative is that Americans are turning away from libraries because of newer technology, but the data shows that most highly-engaged library users are also big technology users. There are some indications that the most plugged-in and highest-income respondents, whom we call “Information Omnivores,” are not as reliant on libraries as the most engaged group, called “Library Lovers.” Still, both groups are highly engaged with public libraries and the most avid supporters of the idea that libraries make communities better. There are people who have never visited a library who still value libraries’ roles in their communities—and even in their own lives: Members of the group we identify as “Distant Admirers” have never personally used a library, but nevertheless tend to have strongly positive opinions about how valuable libraries are to communities—particularly for libraries’ role in encouraging literacy and for providing resources that might otherwise be hard to obtain. Many Distant Admirers say that someone else in their household does use the library, and therefore may use library resources indirectly. Most Americans do not feel overwhelmed by information today, and the people who feel “information overload” the most are actually less likely to use newer technologies—and less likely to use libraries: Some 18% of Americans say they feel overloaded by information—a drop in those feeling this way from 27% who said information overload was a problem to them in 2006. Those who feel overloaded are actually less likely to use the internet or smartphones, and are most represented in groups with lower levels of library engagement such as Off the Grid, Distant Admirers, and Not For Me. This report is part of a larger research effort by the Pew Research Center’s Internet & American Life Project that is exploring the role public libraries play in people’s lives and in their communities. The research is underwritten by the Bill & Melinda Gates Foundation. All references to “libraries” in this report refer to public libraries in the U.S. The findings in this report are based on the results of a nationally representative survey of 6,224 Americans ages 16 and older fielded July 18-September 30, 2013. It was conducted in English and Spanish on landline and cell phones. The margin of error for the full sample is plus or minus 1.4 percentage points. Unlike standard Pew Research surveys of adults 18 and older, this report also contains data on Americans ages 16-17. However, any analyses of behaviors based on education level or household income level exclude this younger age group and are based solely on adults ages 18 and older, which is also noted throughout the report.